When browsing and researching raw denim, you will no doubt come across those pairs that have the “hand-dyed natural indigo” label. Though it is familiar to some, not all understand the true value and importance of hand-dyed natural indigo raw denim. Starting from the end, “indigo” commonly describes the deep blue color of raw denim jeans; and “natural indigo” is specifically derived from the plant, “Indigofera”. We won’t discuss the long history of Indigofera , but essentially the indigo is extracted by processing the plant’s leaves in such a way that it’s converted into a dense chunk of powder (see below photo). This powder can be broken into smaller chunks, mixed with other substances, and – voilà! – you have yourself an natural indigo dye solution. Natural Indigo Bucket – Ready to Dye! 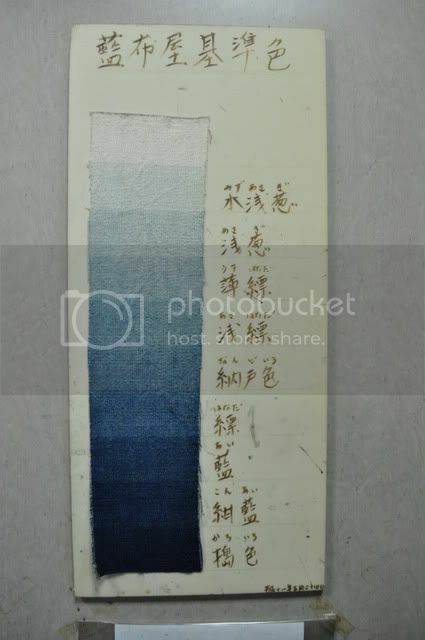 However, as technology has advanced, synthetic indigo has become more prevalent and today is used for nearly all mass produced denim. Thus, the real lure of natural indigo raw denim is its rare nature in that it’s more difficult to handle production-wise and is significantly more expensive (some even go as far to call it “Blue Gold”!). As for the mechanical side, “hand-dyed” denim refers to when (as the name implies) the cotton is hand-dyed (or “dipped”) in indigo prior to being shuttle woven. Considered a more traditional approach and utilized by numerous Japanese denim brands, the more dyes or dips, the darker the cotton. It is an extremely laborious process and sometimes the cotton is dyed or “dipped” as many as 15-20 times. Compared to machine-dyed denim, whereby the indigo dye only “clings” to the surface of the cotton yarn (leaving a white core), hand-dyed denim cotton is deeply penetrated right down to the center of the yarn. As a result, hand-dyed denim will not only fade more slowly, but also potentially more vividly. While the price of the hand-dyed natural indigo raw denim jeans commands a higher price than machine-dyed synthetic indigo denim, the real benefit is a more traditional, authentic, and longer lasting garment. Regardless of your preference, bear in mind that this is definitely a case of getting what you pay for! Editor’s Note: This is the first article from our newest contributor, Dandy Harun. An adventurer at heart, Dandy’s passion lies within denim and vintage clothing. He is the founder of Pract Culture, based in Jakarta, Indonesia, but constantly travels the world to deepen his understanding in raw denim.